Now that you know some of the most common words, you have the building blocks that you need to start – many of the same building blocks that Mikey has. The next thing to do is to start building those words into sentences that you can use, even if you don’t know the mechanics of the German language. Once you have mastered the German alphabet [Learn the German Alphabet] and have memorized your first 50 key words (the words that are important to you), it’s time to pick the phrases that are also going to be useful. These are the kinds of phrases that you can find on the first page of any decent phrase book or in an appendix on their own. They might vary slightly by publisher, but it’s a good starting point. For what it’s worth, by the way, I actually wouldn’t suggest using Google Translate. What you type in English may not be commonly said in German, and the translation you get back may not be 100% accurate. Google is good if you are rushed, but it does get some things wrong. Don’t plan to rely on it to get around because you are more likely to confuse people than to clarify what you mean. Take the time to memorize your key words, and then the key phrases and you will be much better off when you need to communicate with native speakers. This is also the time to start learning about the grammar. Do not worry about buying a book on German grammar. Here’s a secret no one wants to tell you about languages: grammar is actually very simple. The entirety of German grammar can probably be covered in just a few pages. In reality, we’ve got this great post here on the German grammar you can check out. The goal of studying the grammar is not to learn every facet of the language, but just to get a broad sense of its structure; for example, understanding that German has masculine, feminine, and neuter nouns, and that articles and adjectives change based on the gender and the case (nominative, accusative, dative, and genitive). The point here is to get some broad sense of how the language functions. We aren’t going to get too bogged down in the details. Basically, the key words that you have identified are going to come up in phrases. Some of them will be easy to identify, such as the nouns. They are the same. Other words are going to be slightly different, or very different in the case of some of the verbs. Notice the way the verbs change for the different key phrases. You don’t need to know all of the mechanics, but you can start getting a feel for the way that the grammar works. Look at the word order; see where pronouns and nouns fall in the sentence, where the verbs are, and all the other components that play minor roles in communication. Adjectives, adverbs, and articles add a lot to a sentence, so knowing where they go will help you start to sound a little more sophisticated than Mikey, even if your vocabulary is still rudimentary. Survival phrases are not only necessary, they have two major benefits when learning a new language. They let you start to speak right from the beginning. They give you a sense of accomplishment. Even if you don’t know why you use a particular conjugation, you can get a feel for how a word is conjugated. As you study the words that make the phrases, you will have a point of reference, which makes it much easier, too. Survival phrases will give you the confidence to at least begin to speak any foreign language. You will learn how to pronounce words, and it will be easy to hear them on the radio, TV, and read them online because they are common. These are the phrases that you are either likely to need, or phrases you will want to know in an emergency. Whether you want to use them or end up needing them, key phrases are ones that aren’t likely to be forgotten once you have to know them. There will be ample reasons to use them as you go along. Because the scenarios about Mikey are pretty simple, sometimes even relying on body language with the words, you may feel that the words are enough. That isn’t quite true though. The examples of the 20 key words and phrases did include phrases. This is because of the grammar in those phrases. Since this guide is not meant to drag you through all of the grammar and details of the German language, you need the key phrases to get your point across. It might be possible to eventually get your point across with enough gestures, but taking the time to memorize phrases you are likely to need can significantly reduce how silly you look trying to communicate. It also means getting a faster response so that you can go about your business. Don’t worry – these phrases are ones that you know you need. Take a few minutes to scroll through them, and I have no doubt you will see the value in learning just a few of these to see their values. Pick the ones you feel are the most relevant to your needs and see just how quickly you can start to sound like someone who has been studying German for a while. Welcome! (to greet someone) Willkommen! How are you? Wie geht’s dir/ Ihnen? I’m fine, thanks! Danke, mir geht’s gut! Thank you (very much)! Danke (vielmals)!/ Vielen Dank! You’re welcome! (for “thank you”) Gern gescheh’n!/ Keine Ursache!/ Kein Problem! What’s new? Was gibt’s Neues? See you later! Bis später! Good bye! Auf Wiedersehen!/ Tschüß! I’m lost. Ich habe mich verlaufen! Can I help you? Kann ich dir/ Ihnen helfen? Can you help me? Kannst du/ Können Sie mir helfen? Go straight! then turn left/ right! Gehen Sie geradeaus! Dann links / rechts abbiegen! One moment please! Einen Augenblick, bitte! Hold on please! (phone) Bleiben Sie dran, bitte! How much is this? Was kostet das?/ Wie teuer ist das? Excuse me …! (to ask for something) Entschuldigen Sie bitte…! Excuse me! ( to passer by) Darf ich mal vorbei? Do you speak (English/ German)? 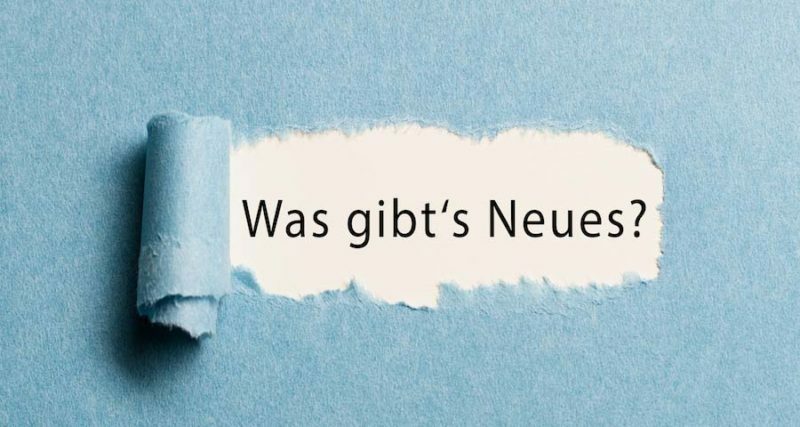 Sprechen Sie (Englisch/ Deutsch)? Just a little. Nur ein bißchen. What’s your name? Wie heißen Sie? Nice to meet you! Schön, Sie kennenzulernen! You’re very kind! Du bist/ Sie sind sehr freundlich! Where are you from? Woher kommst du/ kommen Sie? Where do you live? Wo wohnst du/ wohnen Sie? Did you like it here? Gefällt es dir/ Ihnen hier? What do you do for a living? Was ist dein/ Ihr Beruf? Oh! That’s good! Oh! Das ist toll! How old are you? Wie alt bist du/ sind Sie? I’m (twenty, thirty…) years old. Ich bin (zwanzig, dreißig,…) Jahre (alt). I have to go. Ich muß gehen/ los! I will be right back! Ich bin sofort wieder da! Enjoy! (for meals…) Guten Appetit! Bless you! (when sneezing) Gesundheit! Good night and sweet dreams! Gute Nacht und träum was schönes! I’m Sorry! (if you don’t hear something) Entschuldigung, ich habe Sie nicht verstanden! Sorry! (for a mistake) Entschuldigung!/ Es tut mir leid! No Problem! Kein Problem!/ Keine Ursache! Can You Say It Again? Kannst du/ Können Sie das nochmal wiederholen? Can You Speak Slowly? Kannst du/ Können Sie (etwas) langsamer sprechen? Write It Down Please! Schreib/ Schreiben Sie es bitte auf! I Don’t Know! Ich weiß (es) nicht! I Have No Idea. Ich habe keine Ahnung. What’s That Called In German? Wie heißt das auf deutsch? What Is This? Was ist das (hier)? My German is bad. Mein Deutsch ist schlecht. I need to practice my German. Ich muß (mein) Deutsch üben. Don’t worry! (Nur) Keine Sorge! Here you go! (when giving something) Bitte sehr!/ Bitte schön! Do you like it? Gefällt’s dir/ Ihnen? I really like it! Mir gefällt es sehr gut! I’m hungry/ thirsty. Ich habe Hunger/Durst. What time is it? Wieviel Uhr ist es?/ Wie spät ist es? I need a doctor. Ich brauche einen Arzt. Enjoy the meal! Guten Appetit! Leave me alone! Lass mich in Ruhe! Are you free tomorrow evening? Hast Du morgen Abend Zeit? I would like to invite you to dinner. Ich möchte Dich zum Abendessen einladen. I‘m not interested! Interessiert mich nicht! Can I have your phone number? Kann ich deine Telefonnummer haben? I‘m serious! Ich meine es Ernst.